Mwiruti SHG was on 25th and 26th September 2017 trained on goat milk rearing, pasture management, goat selection and breeding as a mechanism to help build the group members resilient to cope and adapt to climate change. This came as an after event following a visit by PELUM secretariat staff accompanied by the ZNC and RIDEP Programmes Manager to assess and help the group identify one of the agro-ecological strategies that could be undertaken to reduce the group members’ vulnerability to climate change. Partnering with departments of livestock and agriculture each group member is in the process of establishing farm pasture in preparation for milk goats buying and rearing. 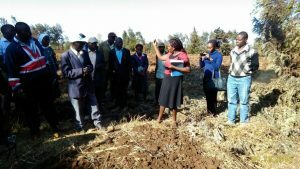 With the zonal initiative budget last year, Upper Eastern and North zone agreed to establish a demo farm for learning on elum practices and principles and to serve as extension education tool for farmers. The demo provides an avenue on which to teach appropriate technologies on elum practices. 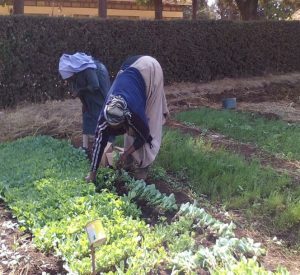 The elum demo farm was established as a zonal initiative in 2016 with the support from PELUM secretariat with the aim of showcasing the many different techniques and novel practices in organic farming and kitchen gardening. This include compost production, tree nurseries for agroforestry and animal fodder, vegetable kitchen gardens, backyard poultry and efficient crop watering methods. These are low cost/no cost appropriate technologies that farmers and mostly women can implement at their homes. To date several groups of farmers have been trained and replicated the same at their farms. For sustainability CEFA organization hired a gardener and is able to maintain the farm through proceeds from sale of tree seedlings and vegetables to the neighbouring communities and schools. 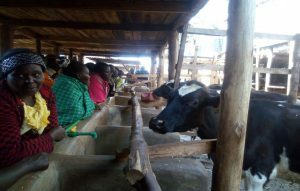 With the aim of gaining practical experience and learning about the complex connections of issues in agriculture, business and the environment, a group of 30 dairy farmers in Upper Eastern Zone travelled to Meru on a visit to a successful agribusiness farm. Farmers were exposed to the effective system of fodder farming, animal production, feeding and treatment, milking, value addition, distribution of milk to the market and record keeping, automatic removal of the animal waste from the farm, production of organic manure and biogas using the waste. In this case, farmers became familiar with the process of managing healthy animals, the maintenance of manure and the use of manure for fertilization of agricultural soils. The emphasis for the trip however was on development of agricultural value chains and in this case milk value chain. Farmers learnt on how to add value to their milk to fetch better prices at the market that will consequently improve their livelihood.